The Microlino was developed by the Swiss company Micro Mobility Systems. The small electric car takes design cues from the iconic BMW Isetta, with its single front door opening forward to present bench seating for two. Despite its small size, the Microlino still packs surprisingly decent specs. The little bubble car’s top speed is 90 km/h (56 mph) and range is estimated at 125-200 km (78-125 mi) with either an 8 kWh or 14.4 kWh lithium iron phosphate battery pack. Considering that the top speed places the Microlino more in the city-driving category, that range is likely plenty for most, even on the smaller battery pack. Power is supplied by a 15 kW (20 hp) motor that provides 110 Nm (81 lb-ft) of torque. While acceleration won’t be quite like a Tesla, it can still provide a 0-50 km/h (32 mph) time of 5 seconds. Not thrilling, but good enough for city driving. This is a perfectly usable car for commuting to work and back, and for local driving. The great thing is it is also more weatherproof than a motorcycle so also perfect for year round commuting. 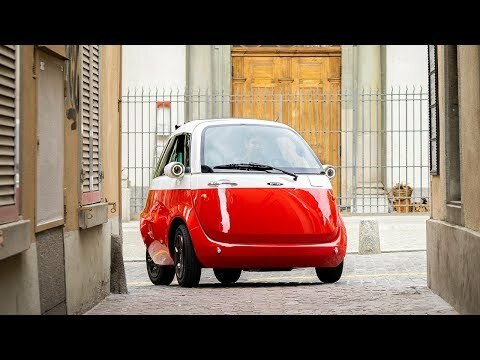 Watch a short promo video at https://youtu.be/-n-pzXefQW8 and more info at https://electrek.co/2018/09/14/microlinos-electric-bubble-car-preorders/ and their website at https://www.micro-mobility.com/en/. Im #HambacherForst wird ein 12.000 Jahre alter Wald gerodet für eine umweltschädliche Industrie, deren Tage längst gezählt sind. Falls ihr euch fragt, wie es um den #Naturschutz in Deutschland gerade steht. Das Thema interessiert mich immer mehr und werde das für mich inhaltlich auch vertiefen. Werde mich hier reinfuxen und schauen auch die Familie zu motivieren. Änderungen sind ja schwierig bei Menschen.